A different kind of day…. Today we need to cover many kilometres and an early start is called for, well early by local standards where hotel breakfasts do not start till 08:00. 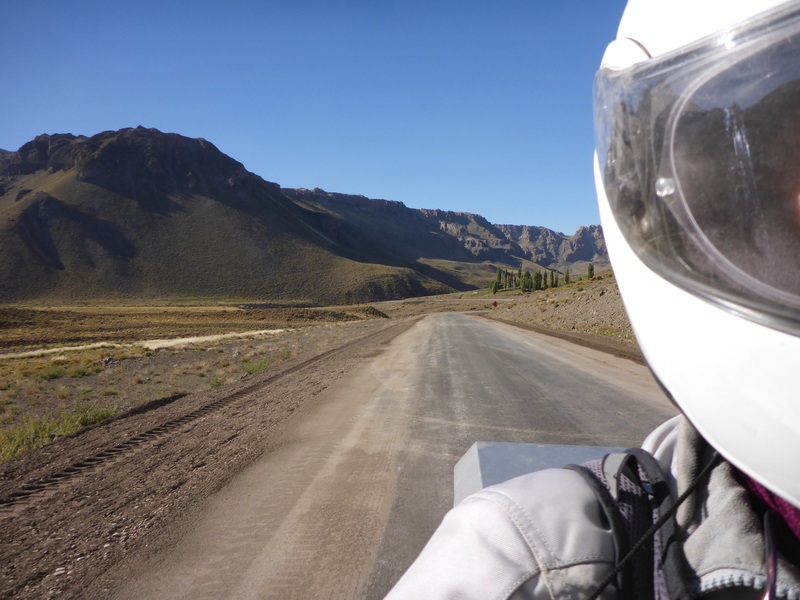 We leave Chos Malal heading northwards on Ruta 40, which is a 3,500km road running the length of Argentina along the eastern edge of the Andes. 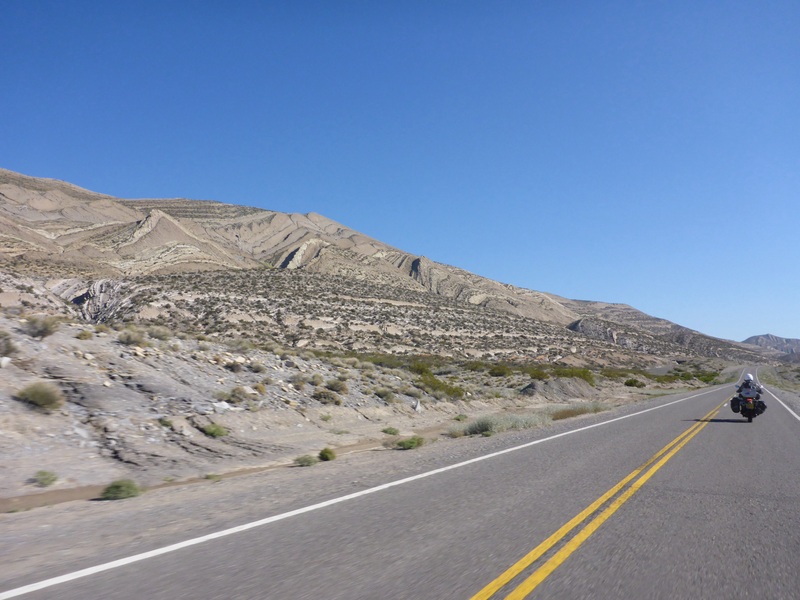 Our destination is San Rafael, some 550km up the road, which is well above our 350km per day average. With our departure for Easter Island rapidly approaching we need to ensure we are back in Santiago by the 3rd and have some 1,200km to cover via Mendoza, our planned route. The road is perfect, smooth tar swings right and left, up and down. 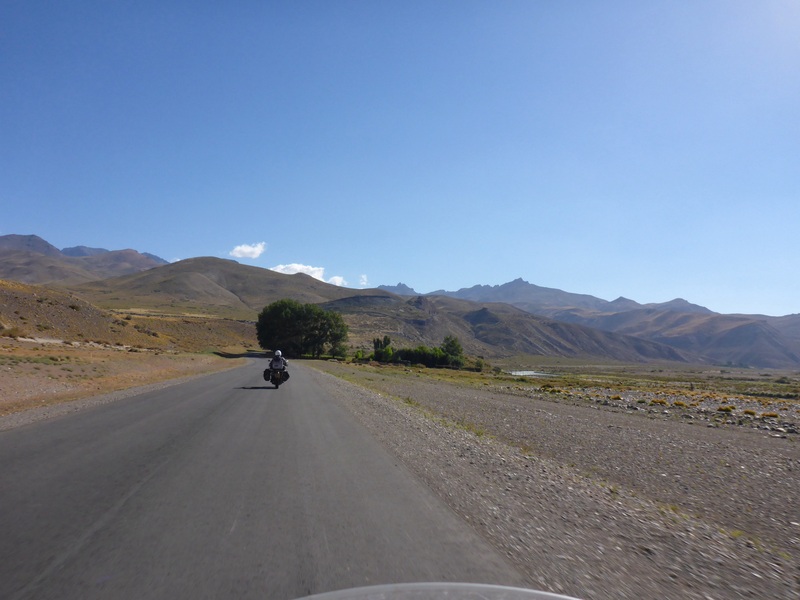 It is a pleasure to ride, the road goes to all points of the compass literally as it snakes around hills and mountains, crosses broad plains and passes under the watchful eyes of volcanoes whose rock and snow colouring reminds me of the bald eagle who also would be looking down from above surveying their world as the volcanoes do. 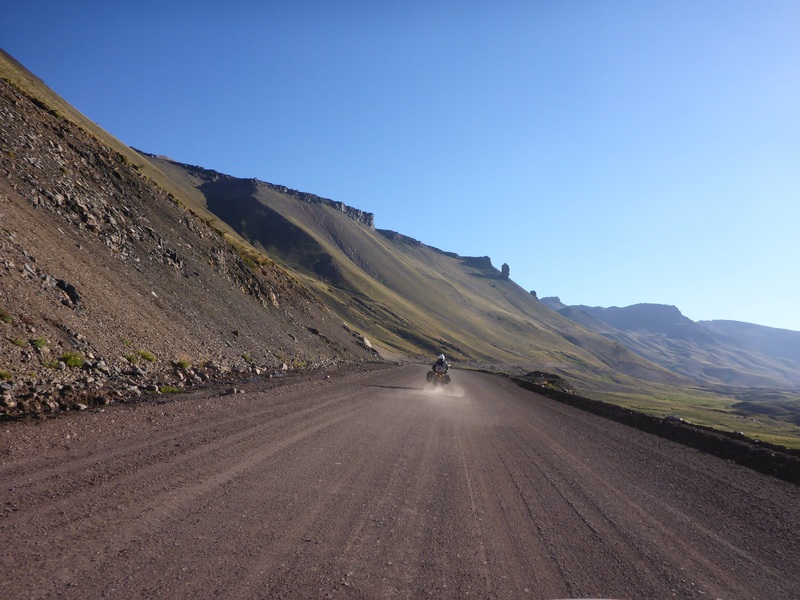 Ruta 40 towards San Raphael is a fabulous riding road – why so few people and no bikes?? 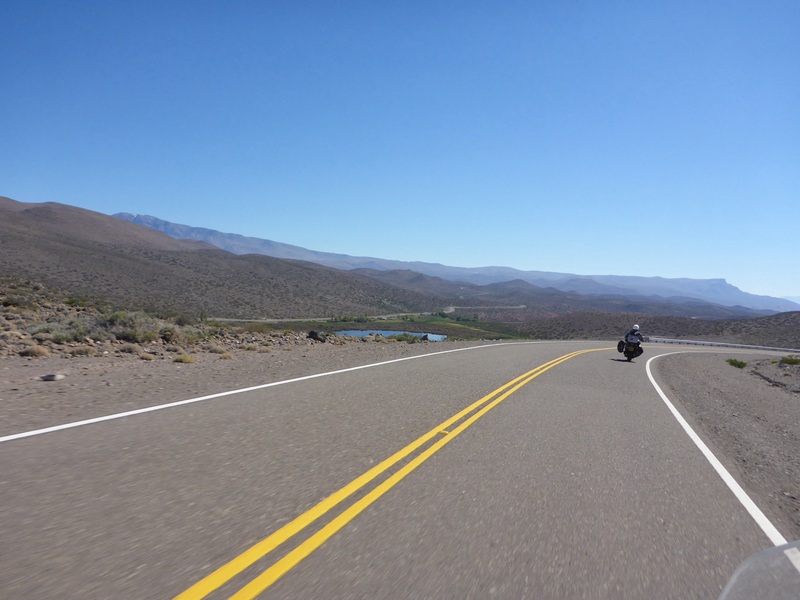 We make good time, the road is free of traffic and we are enjoying the ride in beautiful and spectacular scenery: what more could you ask for, absolutely nothing from a rider’s perspective. Then the road abruptly turns to dirt with a sign promising at least 40kms of the surface. We had thought that our 120kms on dirt yesterday was more than enough for a fews days, but no, we are to get more practice. As we carefully pick our way along the surface at slow but steady pace our interest in the scenery diminishes as we focus on the task at hand. This will impact our journey time considerably as we start to contemplate how this delay may require us to rethink our destination for the day. After some 30 kilometres ahead is a car stopped with the bonnet/hood up heading in same direction. We pull over to find an English couple, Mitch and Mary whose hire car bash plate has lost the front bolts. They are attempting to secure it with string, and while I can offer no additional skills or advice, Anne remembers we have a packet of cable ties and we offer them a couple to fix the problem. I notice we have not opened the packet in seven months on the road and it contains 50! We can definitely spare a couple. 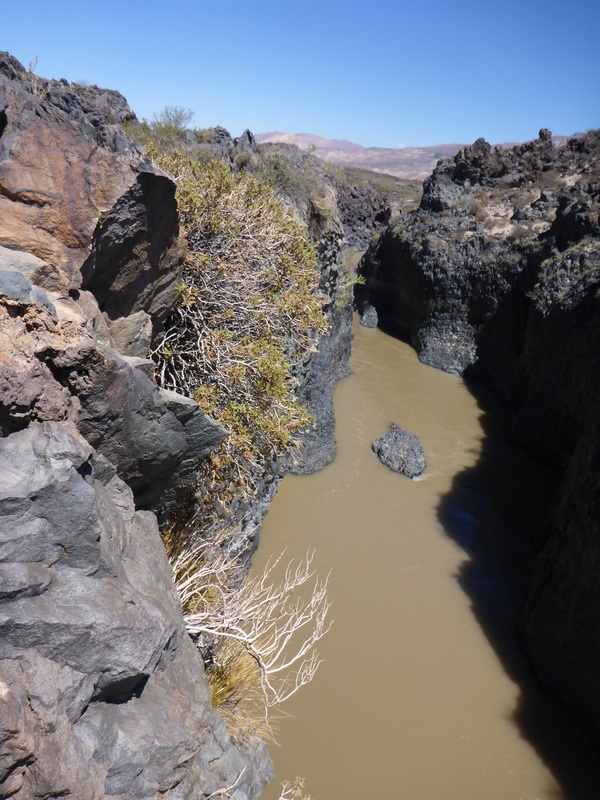 They set off ahead of us on the dirt and we meet again at a bridge where the river has cut through the lava flow creating an interesting small gorge. They offer us some of their sandwiches and tomatoes plus half and apple with makes a great change from tinned tuna and dried biscuits. 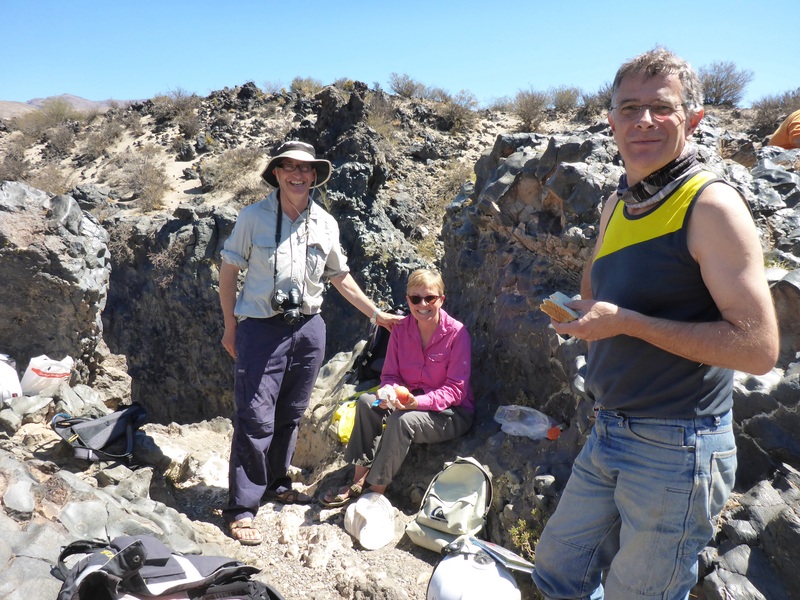 They are retired doctors and enjoying a couple of months in Argentina and Chile. Cleverly they spent time in Spain to improve their Spanish before undertaking this tri. We cross the bridge after lunch and are back on tar, this however is potholed and in places has been returned to dirt and gravel. Lack of road maintenance makes me wonder when this stretch will be returned to dirt when then potholes, which show no sign of repair, become too numerous. As always as you have a thought, such as poor road maintenance, around the next corner there is a new road being constructed. As we navigate the track alongside the new smooth, but un-tarred surface our thoughts of driving there are extinguished by the huge gaps where culverts are being dug! We are directed up onto the road under construction which has some tar and some areas with gravel. We are doing ok, then surface changes to loose rejects from the prehistoric golf ball factory dug up by Fred Flintstone. I run into this at 50km per hour, fine on normal gravel, but after a few seconds I am into a massive tank slapper, handle bars alternately right and left, then BANG, I am down, the bike crushes my left ankle as my left side hits the ground. The bike and I end up facing backwards having done a 180 degree spin. Anne stops and while I am saying I am ok, Anne urges me to stay down, as I have a tendency to leap up after motorcycle accidents regardless (December 2012) then silence reigns except for the snapping of Anne’s camera shutter recording the event, just for you the blog readers of course. As usual adrenaline kicks in and apart from the sharp pain in my ankle I feel fine, standing is a different proposition but I can put some weight on my left leg. The blow from the bike is in almost the identical place to where I broke a non weight bearing bone in my leg some six years previously by, yes you guessed it, dropping a BMW motorcycle on it. I now sit at the side of the road, having been told by Anne to sit yet again as we wait for the two doctors to catch us up. When they arrive, I realise I have no UK National Health Card on me, so they probably will not treat me. They provide good advice, don’t take my boot off as it is providing support and restricting the swelling which I can now feel happening. A local pickup slows as Anne flags it down, but does not stop to help which we find surprising. That would never happen in the Australian bush. Anne and Mitch get my bike up, undamaged apart from the windscreen that has split in two. A plan is devised to see when the tarred surface starts, which turns out to be around the next corner, just a kilometre away, so close yet so far. Anne bravely takes both bikes to the start of the tar. We decide that an X-ray for my ankle is the next priority. I can ride but gear changes are a pain, literally. 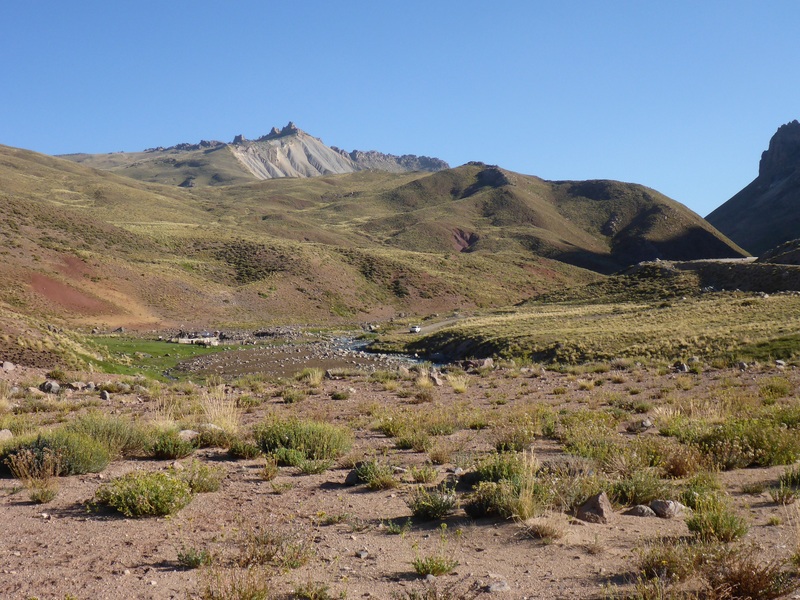 We decide to head back into Chile and the city of Talca some 200+ kilometres away which will have better medical facilities. 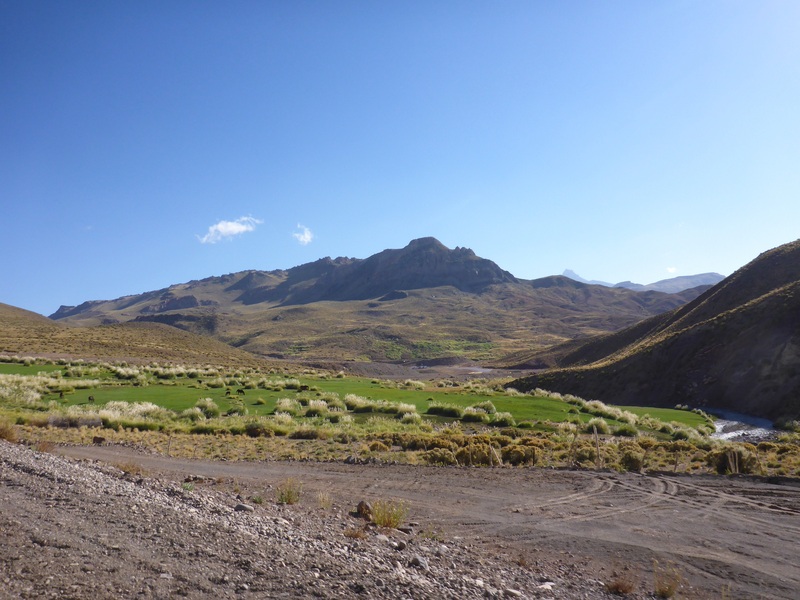 We start to climb eastwards up into the Andes, such spectacular scenery. I am limiting my gear changes as they have become progressively more difficult to make as the leg swells. 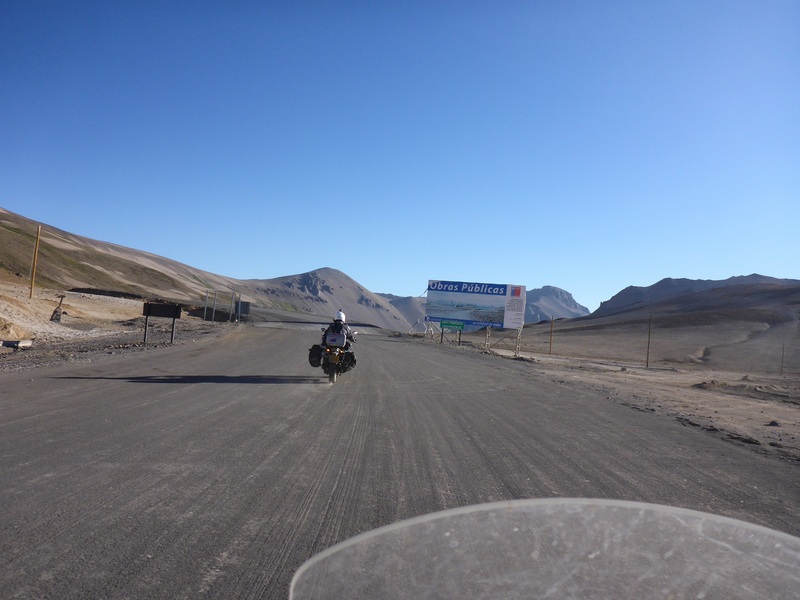 The border posts on both sides are some 40km apart so we complete the Argentine side and then ride up a gravel road, again, towards the summit with the most spectacular scenery. One could spend days here, maybe horseback is the way to see this area as they are slower and more sure footed than bicycles. 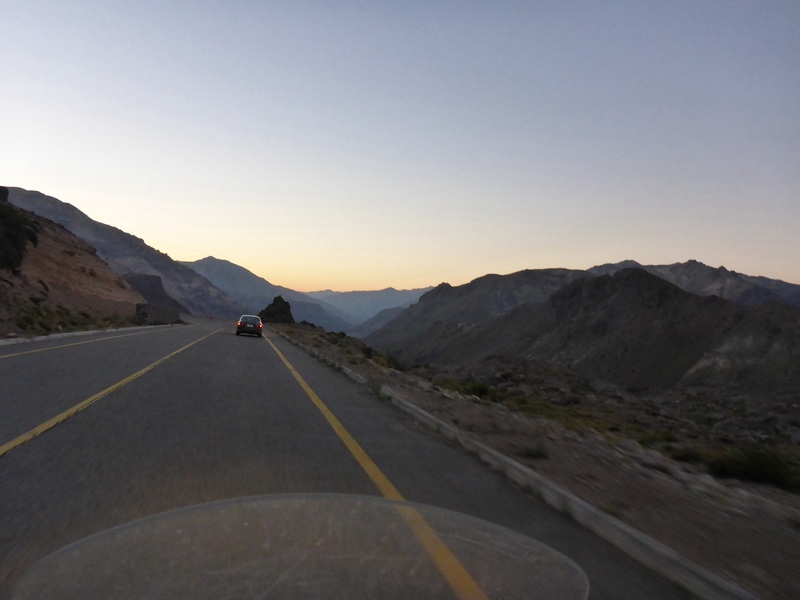 We reach the top of the Pehuenche pass at 2,553 meters and begin an equally spectacular decent, but on tar roads. 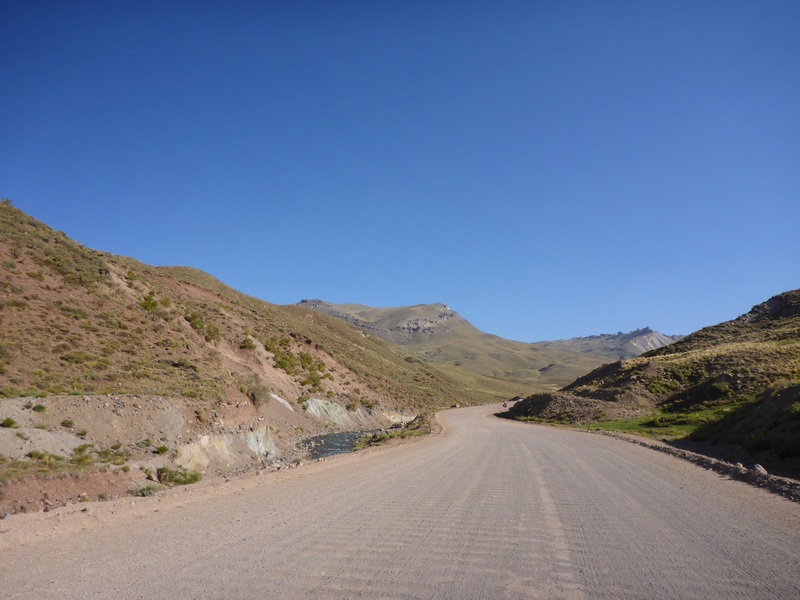 We have found over the years that roads leading to border crossings are a source of national pride and each country likes to show off with well built roads, such as in Chile’s case here, with the Argentine side still under construction. 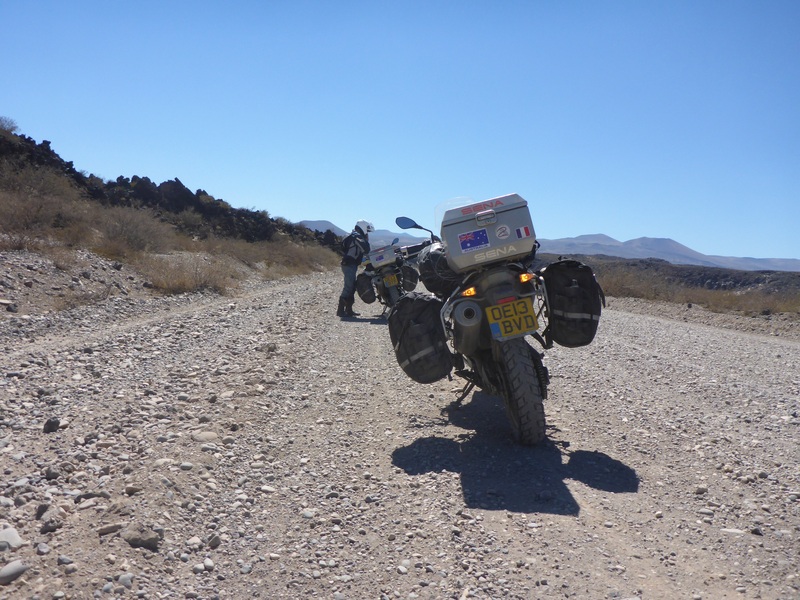 You can guess where the Argentinian/Chilean border at Paso Pehuenche is!! 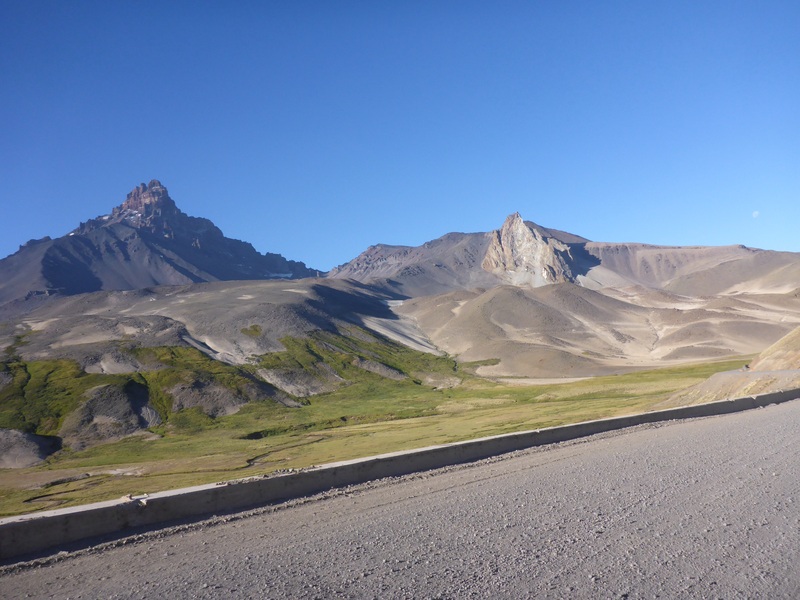 Our swift passage down the pass is stymied after 20 glorious kilometres at the Chilean customs and immigration post, firstly by arriving behind a coach load of tourists, then by the first officious immigration officer we have met in seven months of travelling. 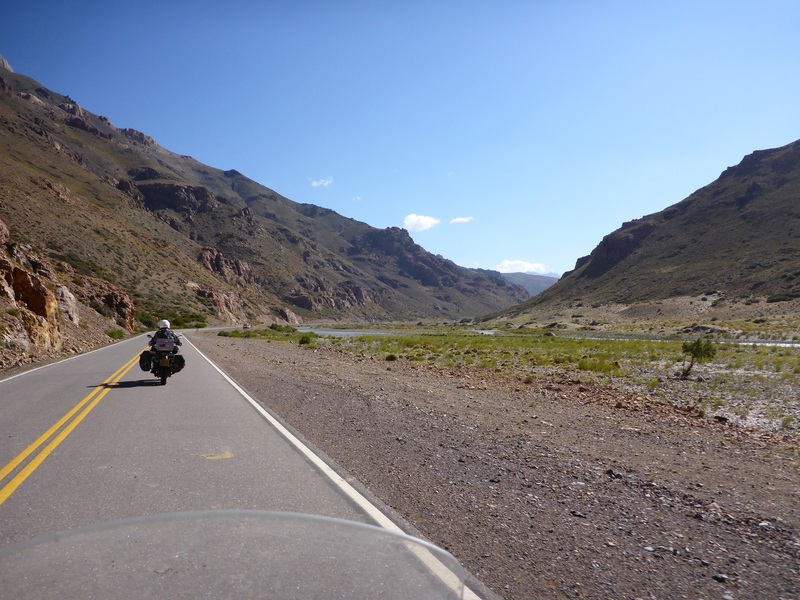 She first wants us to go back to Argentina, an 80 km round trip journey for some form we are supposed to have. Anne refuses as we are trying to get to a clinic for a leg X-ray. I am sitting on the floor to keep the weight off my ankle, but this does not improve her mood. 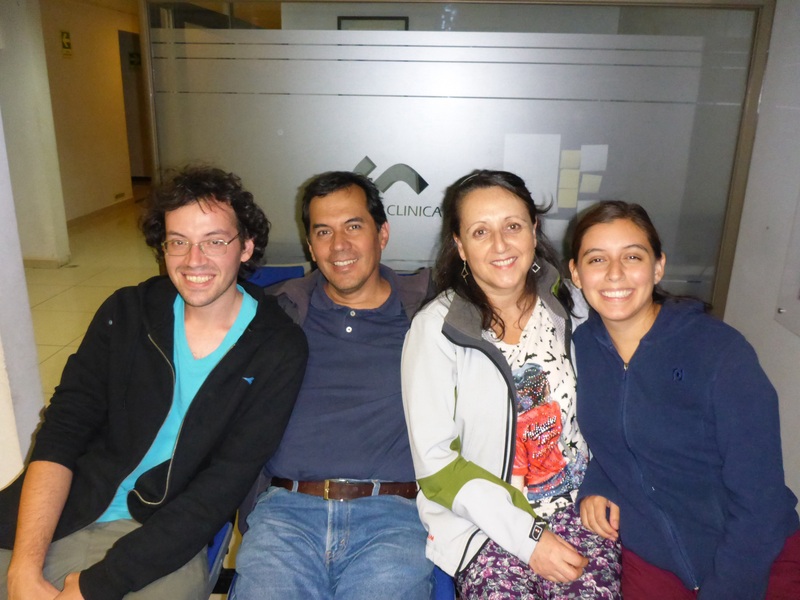 Then a family of four from Talca; Ricardo, Marta, Diego and Monserrat offer their assistance in dealing with the immigration officer. They wait as we complete the paperwork. It is now 20:00 hours and the sun and temperature are going down fast, they offer to guide us to a medical clinic in Talca. Our strong preference is not to ride at night, but getting the X-ray done is a priority. We descend into the dusk seeing the last dying rays of the sun kiss the tips of the peaks behind us for a brief moment before they are gone, magical. 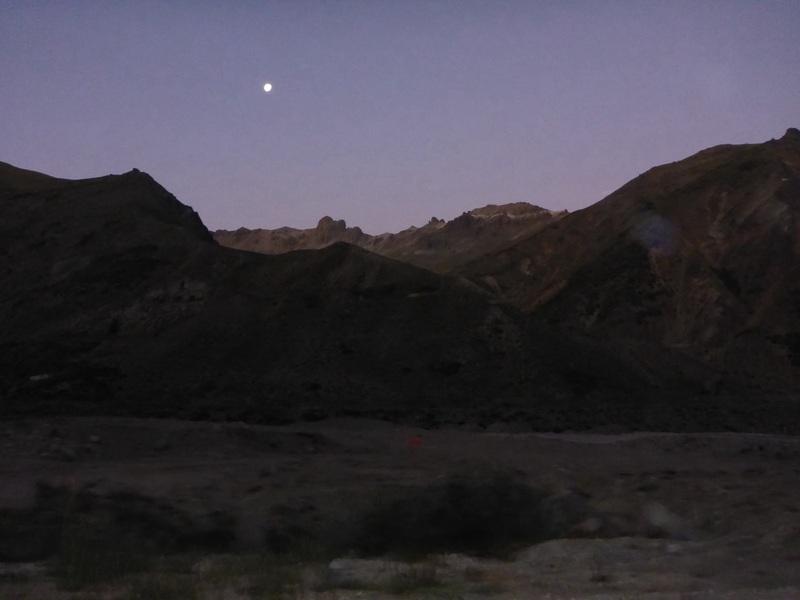 We still have 125km to go and as darkness approaches at least the temperature warms up as we go from 13 degrees celsius to 23 degrees celsius as we descend over 2,000 meters in probably 15 to 20 minutes. 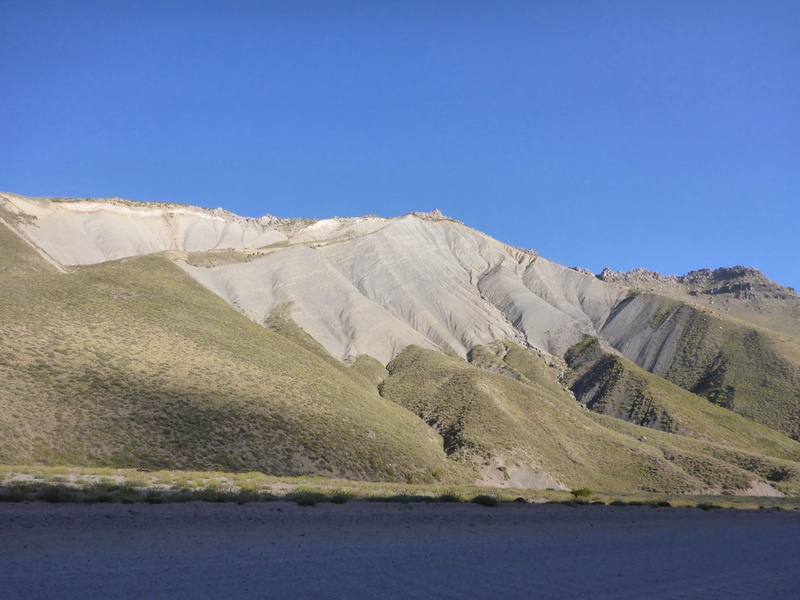 The risks of night riding are highlighted by a fox running just behind Anne’s bike, unlit pedestrians and cyclists appear at the roads edge as we get closer to Talca. We have also been travelling over 13 hours and we both know we need to concentrate hard for the last few kilometres. We have arrived at a clinic in the centre Talca, which are better than hospitals if you can pay I understand, it turns out to be couple of blocks from the hotel we planned to stay at. I park my bike and am greeted by a kindly wheelchair operator which is pushed back over uneven ground with me as a passenger, scariest part of the day, but we avoid an accident. Is this how the clinic gains business? 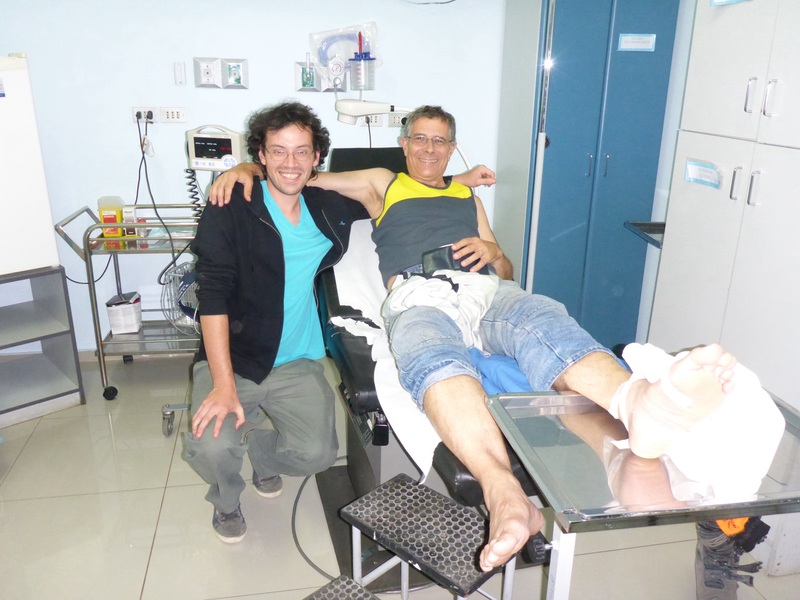 They are quick and efficient and want to X-ray me from top to toe, but I am able to convince them via Diego’s excellent translation that the ankle is the only area of concern. They even offer an intravenous drip with pain killer. An interesting proposition but the pain is not enough to justify such medication, although it might be fun. Good news!….. The X-ray reveals no new breaks, just the old one. Ice, elevated leg rest and anti inflammatories are the order for the day. We can stop thinking of the alternative travel plans. Anne has to ride both bikes to the hotel, with the help of our new friends who have waited at the clinic all this time in case we needed anything. They had even offered us a place to stay for the night as well. Human kindness abounds in this world and we are fortunate to be recipients of it. 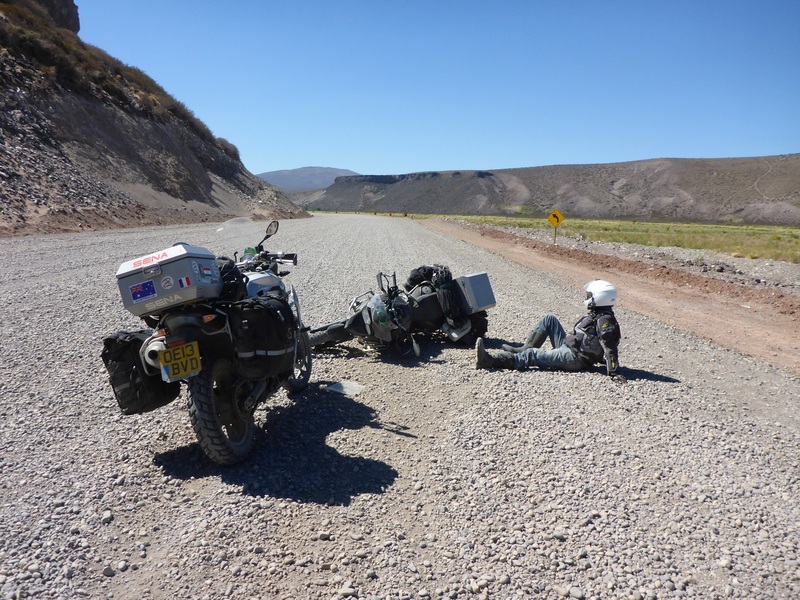 13 hours, 480 km, 80 of them on ripio (and washouts, loose gravel, soft sand & deep pre-historic golf balls), a motorcycle accident, border crossing, a clinic visit with X-ray and making new friends, we fall into bed after a different kind of day…. Trying to keep these kind of acrobatics to a minimum. Good clothing and good luck always help. My foot will take a while to go down so some R&R on Easter Island is what the doctor ordered. Will be back on the road next week. Thanks for your concern. Ouille ! Bon ce n’est pas le pied, tout de même, si j’ose faire un peu d’humour. Bon rétablissement Anthony ! Et bonne continuation pour la suite. Je vous embrasse tous les deux. Not sure how stoic I really am, but thanks for the thought. Adrenaline seems to help for the first few hours and having to get to the clinic for x-rays did the rest. Must now just go through the slow healing process over probably a month. That was a close shave my friend, Your resourcefulness and ability to manage a difficult situation is amazing; Proud of you. Please keep the blog up-to-date with progress on your hopefully speedy recovery. The bruising on the ankle it Is to say the least spectacular. Got the tank slapper added to the list, so will try to stop there. Hard for Anne to see me go down and then have to ride both bikes out on that surface. Out on Easter Island for a few days then back on the bike for more adventures a d new amazing people to meet. Thanks, will take about 4 weeks I estimate as bruised left amd right and on top. No bones broken, but the rest took a bit of a hammering. Gave me a little time to keep the blogs flowing. Anne will be tackling Easter Island so expect spectacular photos and prose. Ouch! Please stay safe, guys. Those pebble roads are lethal. Yes they are, we try to ride as safely as possible, but this was a reminder of what can happen. Glad you understood Fred Flintstone, younger people will not get that i suspect. Recovery will be about 4 weeks I estimate, based on previous accident. Swelling is going down, but sore to walk any distance. Still could have been worse , thanks for your thoughts. Owwwwccchhhh !! . Even I felt that. Although I wonder if coming off hurts more. I was envious of your journey but now think I’m safer ‘armchair riding’. Take it easy for a few days, you deserve it. Since we have a number of gravel roads ahead of us, probably best to stay there for a while. Anne had to move both bikes across that surface after my spill. That was not easy to do. No motorbikes here on Easter island so much safer for me. Anne is a superstar, lucky she is with me. Thanks for your thoughts. So glad that the ankle injuy wasn’t a break. Very impressive bruising which we guess will be very colourful for sometime to come. Easter island is a good place to recover- enjoy. We are now in Mendoza enjoying wine tours and scenery. Thanks we were glad too. Had a wonderful time on Easter Island, more of Annes blogs on the subject to follow. Glad to hear you are enjoying the wines, I assume for medicinal purposes only. All the best on your travels amd again thanks for your help. Was a bit of a bugger. Still swollen and expect will take a couple more weeks to heal. Lucky I have only had to ride for two days since the accident. Will try to avoid repeating the exercise. Heard you saw the Eagles must have been a great concert.